To celebrate Raphael's upcoming birthday - March 28th (or April 6th in some sources)- I would like to present this lesser known but equally fascinating work by the young master from Urbino. 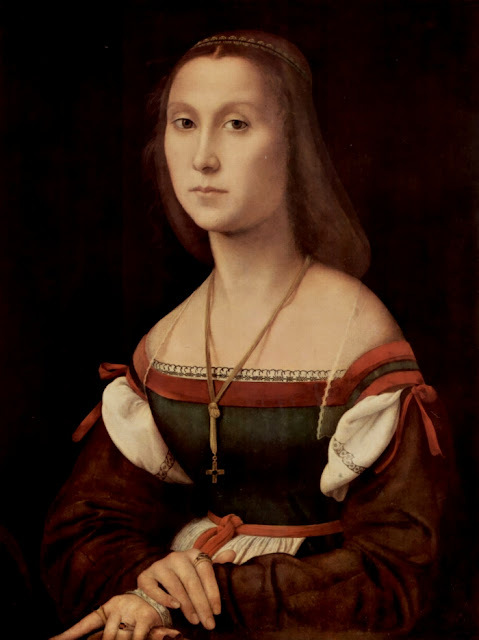 Portrait of a young woman, sometimes known as La Muta is one of only two of Raphael's paintings on display in his native Urbino. It is a relatively recent attribution to Raphael and was gifted to the town of Urbino by the Uffizi after spending much time in storage in the great Florentine Museum. The painting is believed to have been created after Raphael's exposure to the Florenctine style, where he absorbed many new lessons in composition and technique from Leonardo. The title La Muta (the silent one) is not believed to be a description of the woman herself, but a reference to her identity being unknown. Unlike the hot tempered Michelangelo, Raphael used the exposure to Leonardo's works to great effect - with very visible influences of Leonardo's lessons appearing in Raphael's work. A lot has been written about the fierce rivalry between Michelangelo and Leonardo, and the 'Lost Battles' they were commissioned to create for the Palazzo Vecchio. 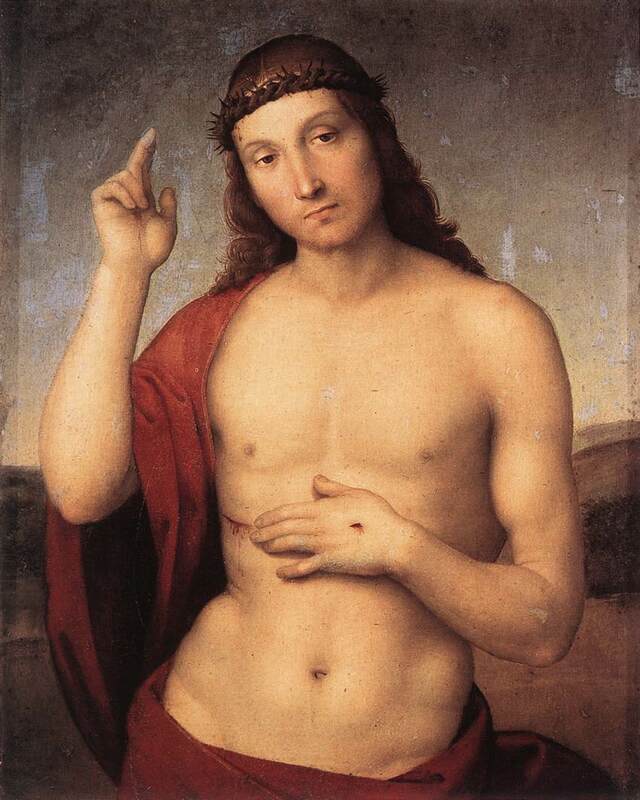 Leonardo's influence can be seen in Raphael's treatment of portraits - his inheritance of the soft treatment of skin and subtle variations in of posing body parts, particularly the hands and torso.Raphael's ability to learn, emulate and surpass his teachers is something that is a fabulous template to anyone striving to better themselves. A mixture of some natural ability plus a great deal of work to hone one's skills is a great life lesson - as well as a testimony to a research based approach. The identity of the sitter in La Muta is presently not known. The depictions of her hands are particularly noteworthy. I would like to draw attention to them as this is an excellent example of Raphael enhancing his own style based on lessons learnt from Leonardo. The famous Mona Lisa is reported to have been commenced 1503-4. It is widely accepted that Raphael had occasion to see this work in progress during this time, evidenced by an extant sketch he made. Leonardo is particularly famous for his depiction of hands - however it seems it did not take the young Raphael too long to absorb Leonardo's lesson and add his own enhancements. Wonderfully visible in La Muta is Raphael's treatment of the woman's hands. 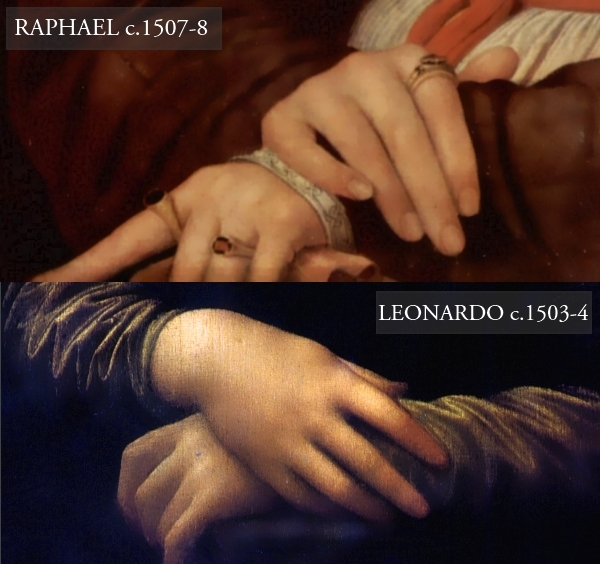 Partly inspired by the crossed pose of the Mona Lisa, but with an addition of a straightened index finger, allowing Raphael to highlight the structure of the knuckles, adding an extra degree of realism that is not suggested in Leonardo's treatment. As also seen in Portrait of a young man with an apple, there are important symbolic attributes for the hand positioning. In this instance, the stones of the rings worn by the woman indicate her wealth and status - however, the presence of rings on both index fingers are often regarded as denoting self confidence and spirituality. 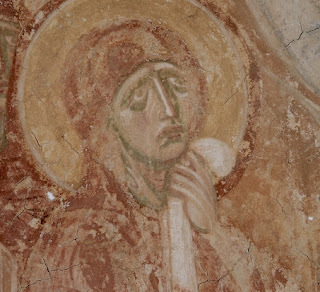 Iconographic studies of this painting are difficult to find. The pose of the fingers is possibly related to the gesture known as mano pantea, which was a symbol of blessing since antiquity, but also adopted in Christian depictions during the Middle ages, where it became known as pax vobiscum. It was widely used in many Renaissance works with a sacred theme, particularly depictions of Christ. In only depicting one outstretched finger, this gesture denotes the sitter's spirituality, without the authority to give blessing. It is believed La Muta's gold necklace/crucifix was added later. As in the Mona Lisa, the overlapped hand position is also represents the sitter as a virtuous woman. It seems Raphael has chosen to accentuate this by carefully depicting the rings, index finger and the handkerchief - another well known symbol of piety since the Middle ages. Next time you are looking at a Renaissance portrait, observe the positioning and adornments of the hands- they can reveal a lot about how the sitter wanted to be portrayed, and how the artist went about achieving it via a deliberate choice of items or symbols to suggest a particular meaning. Thanks,H, I had not known the subtleties of hand positioning in secular portraits beyond the obvious. Raphael learned well from Leonardo. Thanks for a beautiful post. I enjoyed your excellent research about the hands. There is so much to look at in a Renaissance painting. Could you or your readers help me with questions about the sitter's clothing? Her sleeves seem to be not part of her dress but tied to it. Am I right? To wear an outfit like that it would appear that she would require assistance in dressing. Is that a sign of status? @Judy - I am pleased the post provided an enhanced perspective - that was its aim! @Frank. Well observed. I should have commented on that too but being a male perhaps I tend to not focus on garments! Another great resource on this is Women in Italian Renaissance Art: Gender, Representation, Identity by Paola Tinagli. Also see Alexandra's previous post Teaching Women and the arts for more resources related to women in the Renaissance. Am I correct in that there is not a definitive date attributed to this painting? From what I could gather, you are arguing that the date must be after that of the Mona Lisa, right? Hi M! The date for 'La Muta' is approximated between 1507-8. What this dating is based on (apart from knowledge of Raphael's presence in Florence between 1504-8) was not made clear in the sources I read, though may be in another resource. The inference is that Raphael implemented these changes to his style after his time with Leonardo, for which Vasari is our prime source, as well as numerous extant examples of Raphael's drawings from this time. I wish I could report the results and dates in a more scientfic manner than that, but the data simply isn't there. In any event, I dont think there would be many who'd be willing to argue that the influence of Leonardo and others on young Raphael was a figment of Vasari's imagination! The visual evidence alone is quite compelling. Fascinating post, Hasan! I appreciate learning these fine subtleties that I never knew about nor noticed before! Cheers Vicky! I learn just as much preparing these posts. I was suprised no other description I had read actually looked at the hands and the great tradition behind them - the mano pantea is originally derived from an Ancient Egyptian hand gesture for example!